I am very disappointed in some naysayers saying ancient African writing never existed,especially when I have given ample information on why these ancient writing languages go back further before colonial or alien contact with Arabic and European cultures. tsk tsk.Given how when I was here you used to always show up in threads pertaining to Africans or people of African descent,all of sudden you are disinterested. Why? The alphabet is not "western" is Latin. Romans copied to Greeks and Greeks copied to Phoenicians so, in the end is not western. The alphabet and writing systems shown in this section are clearly influenced by Latin alphabet, and appeared with the first contacts with the West and certainly were not invented in sub-Saharan Africa either. Symbolic systems aren't necessarily writing systems, and symbols are part of the human specie anywhere you go. There are few writing systems invented independently from the alphabet of Semitic origins. The ancient Sumerian, and probably Egyptian and Chinese seem to have an independent origin in the Old World, while in the Americas, Mayan was the single writing system native to the New World. While I'll agree some of the character writings used in a different systematic matter are simply psymbols, there are characters and lexicons posted in the OP that are clearly alphabets. Many researchers have concluded these African characters like the Tifnagh and esoteric Iksri are writing systems. The Mayan writing system seems to be highly rooted on symbol iconography ,however it is considered a form of writing. If Mayan way of iconography can be seen as alphabet ,so can some of these other African alphabets. Hell the Egyptian hieroglyphs have 3000 letters but are still considered writing. 1. Godka Xararka in Las Anod District. 2. Qubiyaaley in Las Anod District. 3. Hilayo in Las Khoray District. 4. Karin Heeggane in Las Khoray District. 5. Dhalanle in Las Khoray District. 1. Baar Madhere in Beledweyne District. 2. Xabaalo Ambiyad in Alula District. 3. Harti Yimid in Las Anod District. Yet, these strange edifices must have had a definite purpose. Local opinion holds that they used to serve as altars or as sorts of religious monuments in the era when nature-worship was practised in the Land; still others consider that the Taalos mark ancient graveyards in which were buried important personages — chieftains, rulers, etc. together with their personal effects. In any case, these mute sentinels could, no doubt, tell much about the country's cultural and historical past and give us a glimpse into the life-story of by-gone ages. Although it is difficult to determine what caused the ancient Somalian system of writing to disappear altogether and how long it flourished, etc., there is no doubt that the encroachment of foreign cultures had greatly contributed to its final decline and disappearance. An interesting point, however, is that this script system was apparently based on vowel sound, not a Word-Picture writing as in ancient Egypt. As generations succeeded one another and people acquired better technical and scientific knowledge there were constant reforms and improvements called forth by the new social conditions of the age. This process might have been repeated over and over again in subsequent periods in the history of the land, until the very old forms of Somalian script finally died out and were completely forgotten by later generations. Your User Name is somewhat ironic, in that the ancient capital of Ethiopia was Aksum, which remains a most holy place in Christian Orthodox Ethiopia. 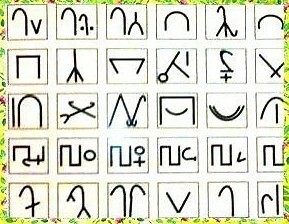 Ethiopia has had for many centuries a writing system called Geez, which is similar in some ways to the Sudanese, and which is still in use in modern day as the standard writing system of Ethiopia. See http://www.ancient-origins.net/history/z-alphabet-origins-and-most-ancient-written-languages-007873 for a good article on ancient writing.